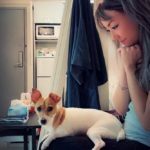 What to Look for When Buying Puppy Food for Labs? Does My Labrador Need a Specific Dog Food? What Other Ingredients Does Good Labrador Dog Food Need? Lab puppies are large breed pups. Therefore, they have different nutritional needs compared to, let us say a Chihuahua. The structure of Labrador pups is also different, and this is why you need to look for breed specific food. A lot of the time, large breed puppy food will suffice. Lab pups have a ton of growing to do to go from their puppy bodies to their fully mature ones. Due to this, Labrador puppies are more susceptible to nutritional imbalances. A calcium imbalance can cause these puppies lots of problems, whereas too much calcium results in hip and elbow dysplasia and other musculoskeletal deformities. Food made especially for Labradors take all this into account and regulates all the ingredients so your Lab baby can grow correctly. Calcium is not the only factor we must look out for. Excess calories can also be a problem. Calories that aren’t regulated cause puppies to grow too quickly and become overweight. This will put extra strain on their joints and bones. 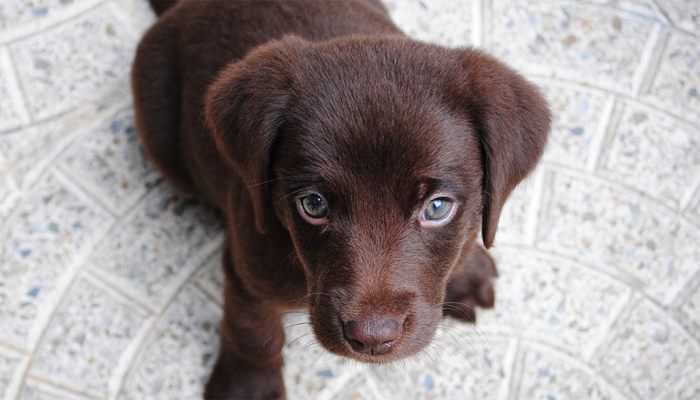 Let’s take a look at the balanced recipes of these 10 Labrador puppy food options. 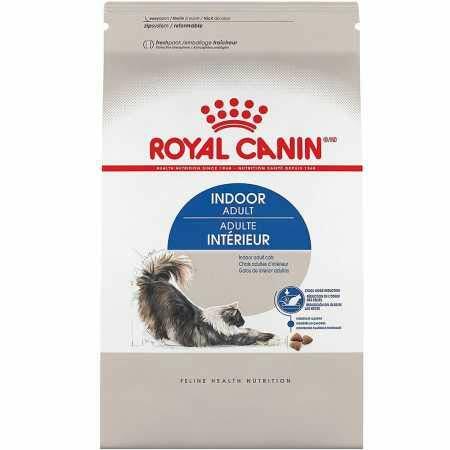 Here from Royal Canin, we have to breed health-focused food just for Labrador puppies. Large breed dogs reach maturity later than smaller breeds. They are full grown around 12 to 18 months or even two years! This Lab puppy dry dog food nourishes puppies from 8 weeks to 15 months old. 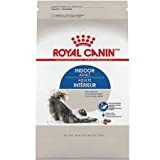 Of course, to support their large breed joint and bone issues, Royal Canin adds the right amount of protein and calcium. Labs also have a unique and water-resistant coat. This recipe for Lab puppies support their coat and skin 100%. Pre and probiotics in this formula are there to support their intestines and digestive system. If you have a Labrador puppy, we suggest getting food specifically engineered for their breed. Why We Like It – Labrador ancestors come from the north. As it’s colder up there, the Labs have a big appetite. Give your pup everything he needs with this formula just for them. You can be sure your Lab baby will get good and balanced nutrition from Purina. Protein is extremely important and is the most important ingredient in dog food. It should always be listed at the first ingredient. In this case, the protein of choice is chicken. Healthy levels of glucosamine levels support their joints and cartilage. Another important ingredient of a lot of puppy food has is DHA. This is the fatty acid that helps with cognitive development. For immune system health, optimal levels of antioxidants are added along with plenty of other nutrients each with their specific purpose, giving your dog a well-rounded diet. Why We Like It – The ratio of proteins and fats are higher than average. This will help regulate your dog’s weight while giving them what they need to grow big and strong! Hill’s has years of scientific research behind each of their recipes. You can be sure their formula will specifically target your Lab puppy’s nutritional needs. 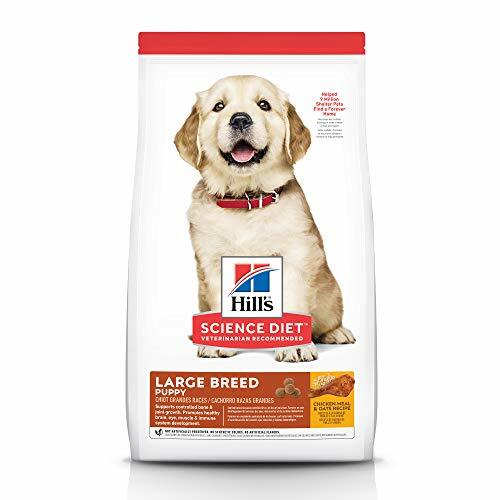 Labradors typically weigh more than 55lbs at maturity, making this dog food a great choice for them. With glucosamine and chondroitin present in the mix to help with bone and muscular development, your Labrador puppy will be a lean machine. All the ingredients used in this dry dog food are global ingredients you can trust. Made in the USA, feel safe in what you’re putting in your dog’s body. For Labrador puppy’s coats, the exclusive blend of omega 6 fatty acids will give them a healthy and shiny coat. 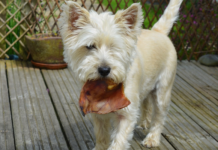 Why We Like It – Mobility issues plagued dogs of a certain age. With the levels of glucosamine and chondroitin in this blend, you will minimize these issues for your Lab baby. The real chicken provides a satisfying taste your dog will love! To help with possible skin and coat issues, optimal levels of omega 6 and omega 3 fatty acids are included. The DHA levels in dog food not only help with brain and eye development, but it will also make your Labrador puppy the smartest around town! 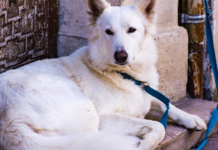 Larger dogs can also have trouble with digestion and absorption of nutrients. 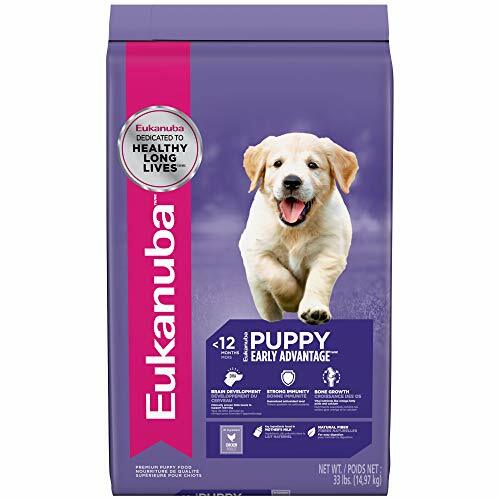 Eukanuba skillfully mixes natural beet pulp and prebiotics into this concoction to fortify your pup’s digestive system. Clinically proven levels of protein and calcium will give your pup the kick it needs to grow at a healthy and steady pace. Why We Liked It – Complete and balanced nutrition is important in any dog food. All the ingredients in Eukanuba’s blend for your Labrador pup will give them a healthy and happy life. This is a brand that caters to a more active pup and follows the highest of standards to help your Labrador pup reach its fullest potential. There are 4 essential ingredients that work together to provide superior nutrition for your dog. The combination of USA sourced beef, chicken, pork and fish make up 75% of the protein content. Another complete and balanced option, Victor Dog Food meets the nutritional profiles set by the AAFCO for all life stages. This option, however, is best for dogs that will weigh over 70lbs at their full-grown weight. Why We Like It – In one package, Victor Dog Food manages to make a blend that meets the needs of both active adult dogs and puppies. A great choice for any dog! This is a wholesome and nutritious choice indeed. Nutro guarantees non-GMO ingredients with no artificial preservatives, flavors or colors. It’s the safest choice there is for your dog on the market. With farm-raised chicken as the number one protein source, your pup will get a tasty meal with a side of strong muscles. Other supporting minerals and vitamins include omega-3 fatty acids, calcium, and different vitamins to support and strengthen your Lab puppy’s digestive system and coats. This is the definition of clean eating for your pup! 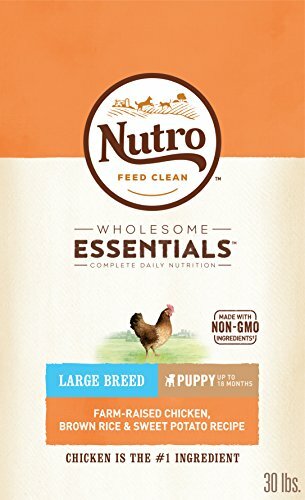 Why We Like It – Nutro is transparent with everything they put into their dog food. The ingredients list on the back is clearly labeled, with no mystery ingredients. Purina always makes it onto our dog food lists. With real protein from chicken, it’s easy on the stomach and easily digestible. The added rice content is a grain that will help with digestion as well. The SmartBlend options always have wet and dry bits mixed together to give your Labrador pup juicy morsels and crunchy kibble to help with oral hygiene. Of course, the glucosamine levels added will lower the risk of any joint issues. As for muscles, the protein levels will help with that, as well as the heart. 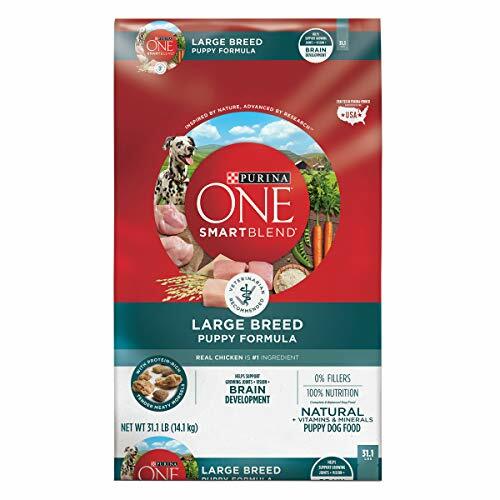 Have the confidence that you’re giving your dog the best with each SmartBlend formula. Why We Like It – Save money on buying wet and dry dog food to mix together. The Purina SmartBlend mixes have taken care of that for you! Following the definition of good dog food, Blue Buffalo puts real meat first. The choice of protein is chicken that helps your dog build and maintain healthy muscles. Because this formula is tailored especially for puppies, your Labrador pup will benefit greatly from the DHA and ARA (important fatty acids found in mother’s milk) to support cognitive and eye development. 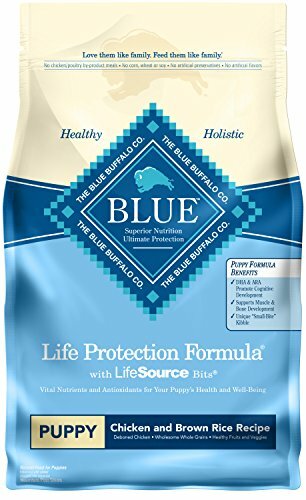 Blue Buffalo utilizes the finest and all natural ingredients that are enhanced with the right vitamins and minerals. You won’t find anything artificial or meat by-products in this puppy dry dog food. Why We Like It – Blue Buffalo is famous for making breed-size and condition-specific foods. You can be sure they do the proper research necessary to guarantee your Labrador pup’s health. This brand is the definition of a balanced meal. The ratio of protein, calories, and fat that fuel your Lab puppy is carefully measured. With the most easily digestible lamb as protein combined with rice, this natural dog food won’t be tough on your pup’s digestive system at all. This recipe also includes L-carnitine, to help your pup convert fat into energy to regulate weight gain. Absolutely no corn, wheat, artificial fillers, flavors or preservatives are added into this dry puppy food. 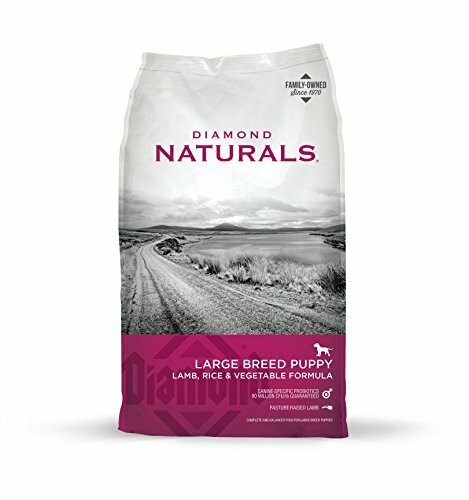 Put your Labrador’s health into the hands of Diamond Naturals. Why We Like It – To bolster this roster of top ingredients, each formula is also enhanced with superfoods to provide holistic nutrition for your Labrador puppy. Most dog foods have chicken as the main ingredient. This is a vet recommended large puppy food that will do your Labrador pup lots of good. Real farm-raised chicken is the #1 ingredient. 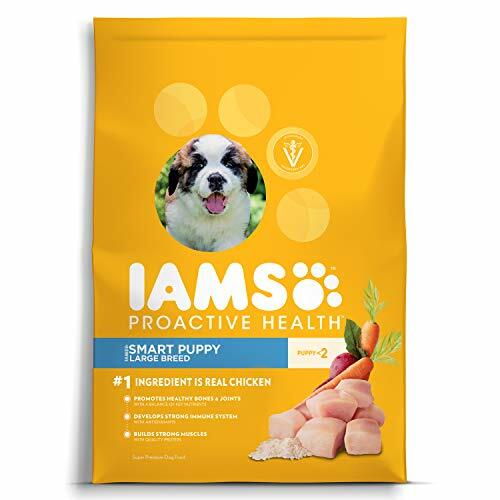 Iams also includes not two, but twenty-two minerals and vitamins that are found in a dog mom’s milk. The transition for your new Labrador puppy from mommy’s milk to Iams will be as smooth possible. The DHA content will support cognitive and eye development just like other brands to make sure your pup will grow to be a regular Einstein. Iams is the way to go for all-around support. Why We Like It – Perfect for the large breed puppy – and that includes your Labrador puppy. Whether you want to target the skin, bones, immune system or coat, Iams has something for you. So – you have a new Labrador puppy at home. Making sure he or she gets the proper nutrients is one of the most important, if not the most, an important part of your job. The health and happiness of your big pooch depend on it. Whatever you do and whatever you choose, remember to pay attention to your dog, not the food. Observe your Lab pup carefully when you’re trying out new food. Read the labels on the packaging carefully, mentally taking note of all the good ingredients and all the ones to avoid. This alone should help you choose the best dog food for your Labrador. We cannot stress enough that cutting back on puppy food is something you should not do. Do not sacrifice quality to save a few bucks. Other than the ingredients, wet or dry dog food options are also something to think about. For your Labrador pup, kibble could be a better option. Why is that? Well, dry food tends to have more complete and balanced nutrition. Everything included in a dry food recipe will be tailored to the specific ratios most suitable for your pup. Pick the right brand and the right ingredients for your Lab’s specific need. Maybe your Lab baby needs more focus on its digestive system, then a grain-free option should be the one you’re looking for. Kibble will also help clean your pup’s teeth as they chew. Another important benefit to eating kibble over wet food is that larger breed kibble is bigger. This slows down their eating habits and prevents bloating, a potentially fatal health issue. With wet food, there’s nothing to stop your pup from chowing down at full speed. Dry kibble benefits the owner as well. It is easier to store and lasts longer than wet canned food. And last but not least, the price point is significantly lower, and it will put less strain on your finances. Just make sure they get enough water at all times to stay hydrated. These are the two ingredients in dog food that specifically treat joint problems. You can find them in supplement form on shelves at the supermarket, but ingesting them through food intake is the best way. Both glucosamine and chondroitin help relieve symptoms of the elbow and hip dysplasia as well as arthritis in your Labrador pup’s later years. Taurine is a protein chemical. It’s an amino acid, which is what proteins are made of. Their main function is supporting puppies’ hearts. Chicken is often found in pup food as the main ingredient. If you’ve read our other food articles before, you’ll know that L-carnitine also plays a part in heart maintenance and heart health. Look for these two ingredients when buying food for Labrador puppies. Look for food with a higher calorie count, fat and protein than adult dog food because puppies grow at such a rapid rate. Cut back on calcium but make sure they have enough. The best food for lab puppies will have the right amount of everything, perfectly balanced. The answer is yes. A puppy needs more nutrition than an adult, as they are still growing. Because Labradors are large breed dogs, make sure you get food for larger breeds. Dog food for them will be formulated with ingredients to meet their unique health requirements, many of which are bone and joint related. If you get dog food that is breed specific, the food will be developed for their digestive, coat and energy needs. The brands will make sure their food meets the caloric intake needs of your Labrador puppy. Watch the calories and fat going into your Lab baby’s tummy. Vegetables are as good for them as they are for us! What they get from vegetables are the proper vitamins, minerals, and antioxidants. The brighter the vegetable, the more antioxidants it will have. Here is a small list of what other ingredients to look for. Vitamin A and E – For a healthy coat and a strong immune system. Calcium (but not too much) and phosphorus – These are for bone and dental health. DHA – This is for healthy cognitive development. Everything tastes good to your dog. Don’t feed them anything that isn’t recognized! You don’t want to know what they use in meat by-products. They could use disturbing things like rendered parts from the slaughterhouse as meat fillers. Such ‘parts’ include leftovers that are not limited to lungs, bones, fatty tissue, brain, intestines and other components. Extremely unappetizing! Make sure none of that ends up in your pup’s food. Artificial ingredients are not added for health benefits. 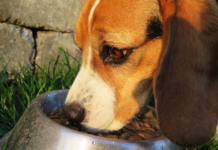 They make the food look and taste better but are detrimental to your dog’s health. If made with good quality ingredients, your Labrador puppy dog will love the taste of their food. 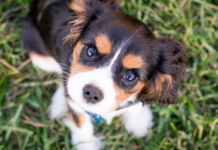 For a lot of us, the cost of puppy food is a big concern. As far as dog food is concerned, it really lives up to the phrase: ‘’you get what you pay for’’. Higher quality and more expensive brands will use better ingredients. Cheaper brands will use what’s called ‘fillers’ – which contain excess amounts of carbs and grain and certain by-products as well. Every little piece of advice here is a general suggestion. As we always say, look at the dog, not the food. Check your Labrador puppy’s weight while factoring in how much food to feed him or her. Monitor their exercise levels to determine if they are getting the right amount of nutrients in their food. Your vet should be your best friend (aside from your Labrador) when choosing the right food for your dog. To make sure your feeding habits are doing your dog good, you can take your large pooch to the vet to get an evaluation every few weeks. When a dog is spayed or neutered, their need for energy consumption decreases. If you recently had your Lab fur baby spayed or neutered, please follow your vet’s directions carefully. Try a basic stainless steel doggie bowl for feeding your pup. It’s near indestructible, easy to clean and can last a lifetime. As for water, try a heavier bowl. Ones made of ceramic or anything with some weight to it will be good, so it’s not as easy for your dog to tip it over. This globally loved breed is one that continuously makes it onto the top 10 lists for the best animal for a family, easiest to train, dogs that great with kids etc. But did you know that this popular breed originates from Canada? High five to all the Canadians out there! They come in three distinct colors: Yellow (butter), chocolate (brown) and black. Labs are from the north and they love water since they are retriever dogs after all. If you have a Lab puppy, be sure to take a look at our life jackets for dogs article! Jess' life is never boring and full of loyalty and love from her fur babies. 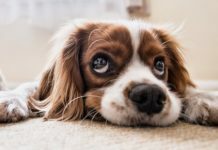 Being able to write about all of these products and being a doggy mom herself, gives Jess insight into what’s important when choosing the right products for our cuddly pals.